Volkswagen looks set to make a clean sweep of the top three positions in the 2010 Dakar, as the “World’s Toughest Race” enters its final stage from San Rafael to Buenos Aires, the finish point. In the overall lead after 13 stages is VW’s former WRC champion Carlos Sainz, but he’s only leading teammate Nasser Al-Attiyah by just two minutes and 48 seconds. American Mark Miller looks to have secured the final podium spot – he is over 31 minutes behind Sainz but almost two hours ahead of Stephane Peterhansel, the highest placed X-Raid BMW driver in fourth. 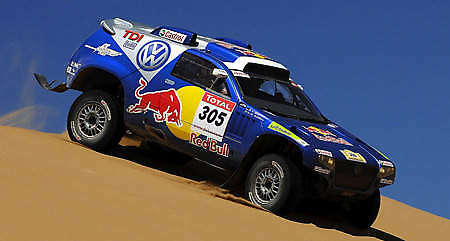 The penultimate stage was won by nine-time Dakar winner Peterhansel. With that, the Frenchman has won four stages in this year’s race, extending his record of stage victories to 55. The relatively smooth and fast wrap up stage will start today evening in South America.